“The Pumpkin King”. This is the name given to the King Cobra we found on Halloween due to the orange shading of his ventral scales and the auspicious timing of the encounter. 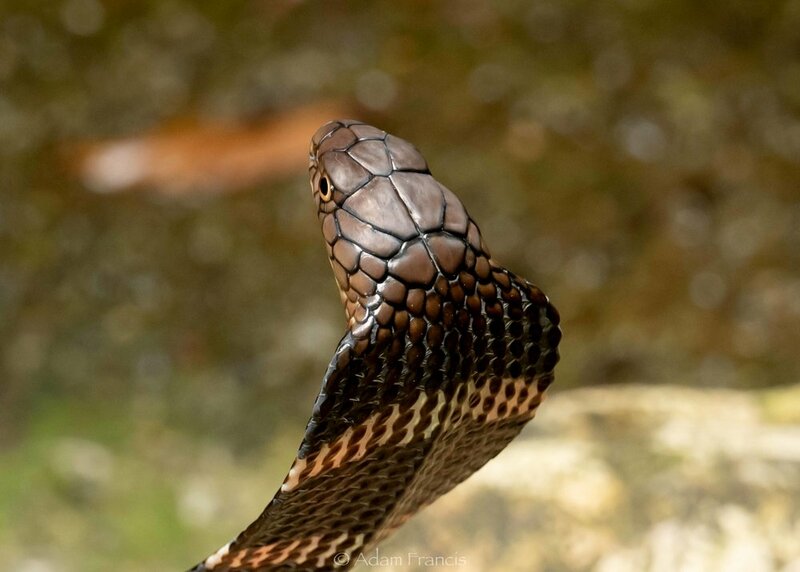 In a previous article we wrote about a juvenile of the species and while they are fantastic and very pretty, almost nothing in the world compares to a mature King Cobra. Before getting into details on our own interactions with the worlds largest venomous snake we would like to talk a little bit more about the species. The scientific name for the King is ‘Ophiophgus hannah’ with ‘Ophiophagus’ derrived from Ancient Greek meaning ‘snake-eater’. 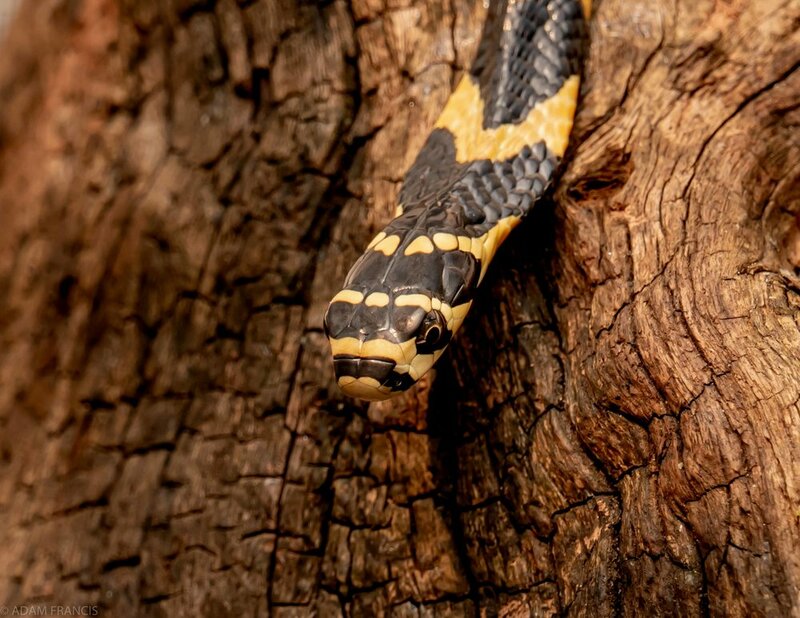 As we explored in our previous Snake Diary ‘Snakes That Eat Snakes’ the name is well deserved as King Cobras feed almost exclusively on other snake species with a particular fondness for Common Rat Snakes and Copperhead Racers. Based on observations the King will first stalk its prey then attempt to deliver a killing bite near the back of the head of its victim. If it doesn’t have the opportunity immediately it may also follow closely behind and strike the lower body and tail while waiting for its venom to take effect before going in for the kill. King’s don’t seem to be picky going for both venomous and non venomous species as well as more risky prey like Pythons and on occasion may even take small mammals or birds. In addition to their size at maturity Kings are able to take down their prey largely due to the ability to deliver a huge amount of venom with a single bite. It is not unheard of for a single bite to deliver between 500mg and 7ml of venom, enough to kill and Asian Elephant in a matter of hours or a single human in less than 30min. 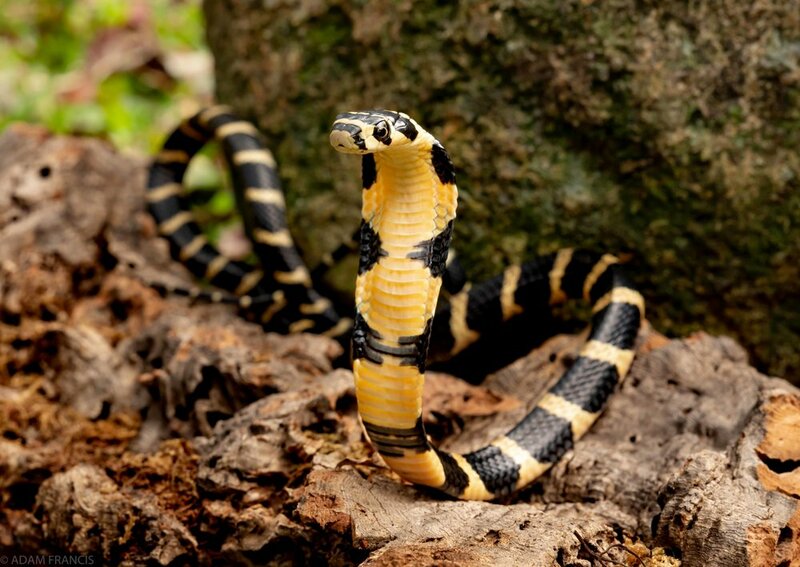 In fact, putting allergic reactions to venom aside the King Cobra is one of the few venomous snakes with recorded fatalities occurring less than 30min after a bite. The venom itself is largely neurotoxic meaning it attacks your central nervous system but it can also be destructive to tissue as a result of cytotoxins or cell destroying venom also found in the deadly cocktail. King Cobra bites are less common than many other venomous snakes due to the rarity of the species and their intelligence which helps them avoid humans in the wild. In terms of appearance, King Cobras range in color and pattern from dark chocolate brown with faint bands running the length of the body to grey, golden brown or almost white when mature. As juveniles there is much less variation with almost all individuals presenting perfectly contrasting black and yellow bands running the length of the body. Kings also have very large venom glands and as such their heads are quite large relative to their body with big powerful looking occipital scales on top. Juveniles as well as adults display this physical characteristic but the colors on the head scales change from yellow and black bands as juveniles to solid color with black outlines in maturity. It should also be noted that Kings are also not technically a ‘true cobra’ and are instead a member of their own Genus, ‘Ophiophagus’. 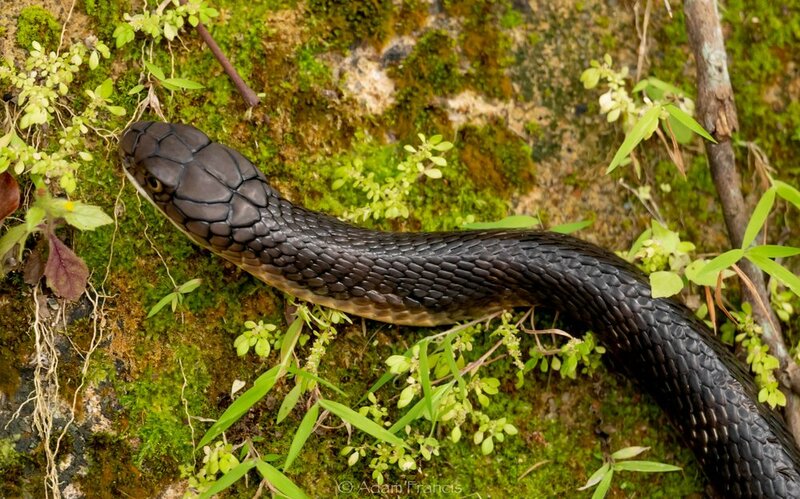 Despite this unique aspect of its scientific categorization it still exhibits many characteristics of other true cobras including its local cousin the Chinese Cobra - Naja atra. For example they are both part of the same ‘Family’ of snakes, the Elapids. They are also both noted for their ability to rise off the ground and flatten out their necks displaying the characteristic cobra ‘hood’. In addition they are both highly visual when engaged in defensive behavior often striking at any objects that get too close. They also both have short highly efficient hollow fangs to deliver venom, and despite a difference in pitch, both are known to hiss as a defensive tactic. There are some key differences from an outward appearance and behavior stand point between these two species however. For example the Chinese Cobras tend to present a monocled pattern on the back of their hoods while Kings are banded, lightly when mature, from head to tail with a single chevron band stretching across the wides part of the hood. When not displaying their hoods the Chinese Cobras still have visible markings on their necks behind the head where as the King looks almost solid in color. On this point, both Chinese Cobras and King Cobras can be mistaken for harmless Common Rat Snakes. The King is especially close in color and markings making for possibly dangerous misidentifications. In order to properly distinguish between the two you would need to see the King display its hood or be highly trained in observing and working with both species and even then mistakes can be made. With that said, once a King Cobra is fully mature they exhibit a physical characteristic unique to their species - their size. King Cobras are rightfully crowned the largest venomous snake in the world with mature specimens frequently achieving lengths of 4+ meters. In fact the largest King Cobras on record have reach lengths of around 6 meters making them as long or longer than almost any other species of snake included many species of python. At 4 meters a King Cobra rising up off the ground would nearly be staring an adult human in the eyes brining us to our next point, the Kings defensive behavior. As snake observers we have to say that there really is no other snake like the King Cobra certainly in Hong Kong and arguably the world. The King is the most intelligent and situationally aware of all the snakes we have encountered in Hong Kong and it is also the most aggressive when cornered. 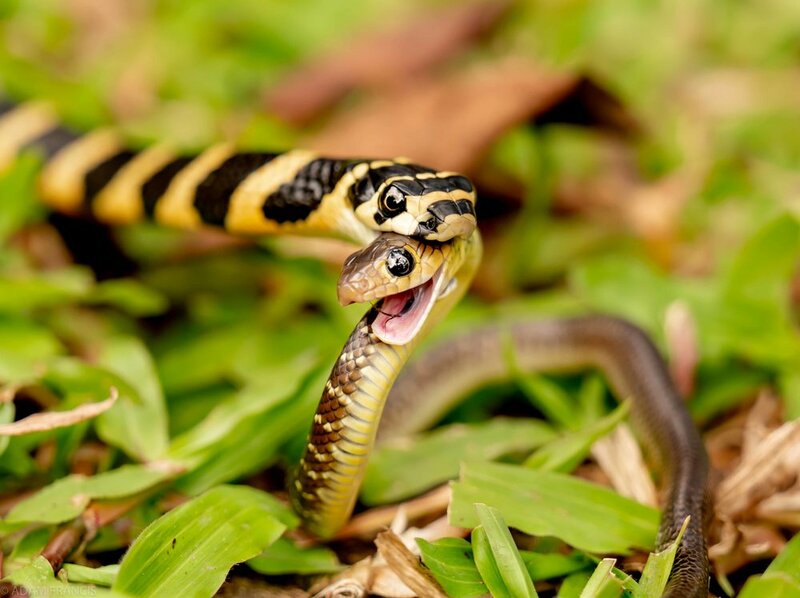 For some context, when photographing a Chinese Cobra they frequently strike at the air and hiss, but as with most snakes if they feel any opportunity to escape they will quickly slither away. King Cobras on the other hand tend to rush their captors rising up off the ground and slithering quickly and smoothly forward ready to strike the moment the opportunity presents itself. They also appear to be able to track multiple subjects at a time and we even noticed them changing behavior if it appeared we were less or more tense at a given moment. One of the most dangerous aspects of their defensive/offensive behavior in addition to their propensity to rush forward is their ability to turn back on them selves extremely quickly. So in the event you find yourself behind a hooded King be ready to back off quickly as their ability to turn and rush over their own body is just as good as their ability to rush forward. Most of these observations were proven true with the King we found on Halloween, and despite some of the more dangerous aspects of this snake we have to say that it was by far the most impressive and beautiful species we have interacted with to date. In fact Hong Kongers should be proud that their Island Nation is home to such an amazing animal. And defensive behavior notwithstanding it is also worth noting that when we first encountered the King it was neither scared nor aggressive and was simply going about its business looking for a meal, so as long as this wonderful species is observed from a good distance there should be no reason to be concerned. If you would like to learn more about the King Cobra please visit the King Cobra Page on www.HongKongSnakeID.com. Rob has also written a great piece highlighting these and some other interesting facts about the King on www.wildcreatureshongkong.org that you can find here.